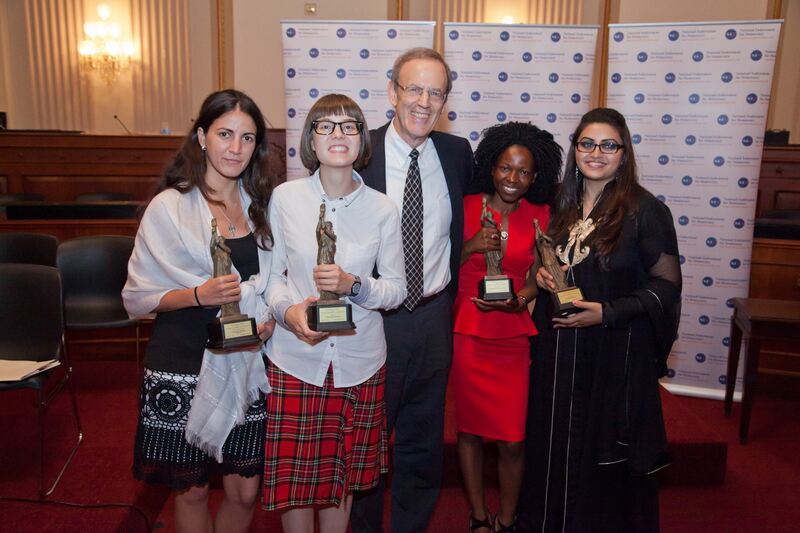 Our Democratic Future: The Role of Youth in Advancing Democracy was the theme for the 2013 NED Democracy Awards, presented on July 17 at a Capitol Hill ceremony in the U.S. Congress. Ismail is founder and chairperson of Aware Girls, a young women-led organization that seeks to provide a leadership platform to young women and girls of Khyber Pakhtunkhwa province in northwest Pakistan. She has more than 10 years of experience working on leadership development for girls and young women; addressing gender based violence; encouraging peace and pluralism; promoting and protecting human rights; and striving to bring women in to the political mainstream. Kichanova was elected in March 2012 as a municipal deputy in Moscow’s Yuzhnoye Tushino district. As a member of the municipal council she fights for more transparency on the part of the local authorities. Kichanova is an avid journalist and civic activist who has been arrested for her outspoken defense of democratic principles. Changachirere is the founding director of the Institute for Young Women Development (IYWD), which encourages marginalized young women in farming, mining, and rural communities to participate in Zimbabwean politics. IYWD has played an important role in calling for peaceful, democratic elections, and the need to guarantee space for the participation of all Zimbabweans in the political system, including the prevention of gender-based violence. Cepero was the leader of the youth wing of Cuba’s Christian Liberation Movement (MCL), the group that organized the Varela project — a citizen petition movement that called for a popular referendum to establish the foundation for a democratic system in Cuba. With more than 25,000 Cubans publicly signing the petition, the Varela Project became one of the most creative challenges to the country’s totalitarian rulers. On July 22, 2012, Cepero was killed in a suspicious car crash along with Cuba’s most prominent democratic activist and founder of the MCL, Oswaldo Payá. Rosa María Payá Acevedo, another young leader of the MCL and the daughter of Oswaldo Payá, will accept the award on behalf of Cepero and the Christian Liberation Movement. The event began with a panel discussion featuring the honorees and moderated by NED board member Michele Dunne, vice president of the Atlantic Council and director of its Rafik Hariri Center for the Middle East. The panel touched on subjects ranging from the motivations that spurred the young activists’ involvement in their causes to the day-to-day logistics and very real risks of operating in countries that are often hostile to democratization efforts. U.S. Senator Robert Menendez (D-NJ), who chairs the Senate Foreign Relations Committee, was on hand to pay tribute to the young activists. He was joined by members of the House of Representatives Ileana Ros-Lehtinen (R-FL), and Mario Diaz-Balart (R-FL). Changachirere dedicated her award to Zimbabwe’s upcoming elections at the end of July. Kichanova, the 22-year-old honoree from Russia, is one such example; she was detained by the police several times for her participation in pro-democracy rallies throughout Moscow. She was recently elected as a municipal deputy in Moscow, leading transparency and accountability initiatives in the local government. While activists like Ismail are threatened with violence—Aware Girls had to move their office of operation in Pakistan due to the rising levels of danger in the region—there are others like Harold Cepero who pay the ultimate price for their work for freedom and democracy. Gershman then announced that the Endowment would continue to focus on inspiring stories of young activists through the Endowment’s upcoming “30 under 30” campaign, which will highlight young activists and small grants (under $30,000) that have made a significant impact on the democracy movement. The campaign will help celebrate NED’s 30th anniversary, which takes place in November of this year.